This image shows one of the reportedly aggressive bees found in Concord, Calif. on May 14, 2016. CONCORD, Calif. (KGO) -- Police are warning residents in Concord this afternoon of a swarm of bees that have apparently taken over an area of the city. Beginning Friday, police received numerous calls about a swarm of aggressive bees in the 3800 block of Hitchcock Drive, according to police Cpl. Christopher Blakely. Many residents reported getting stung by the bees. One woman was chased inside her home after a swarm of bees attacked her and her dog. Several others in her neighborhood were attacked too and stung. The bees are being blamed on the deaths of two dogs that were attacked by the aggressive swarm. A postal worker was also stung several times while she was on her delivery route. Beekeepers say they believe the bees are Africanized, and warn they are very aggressive. "These bees are a little off the wall. 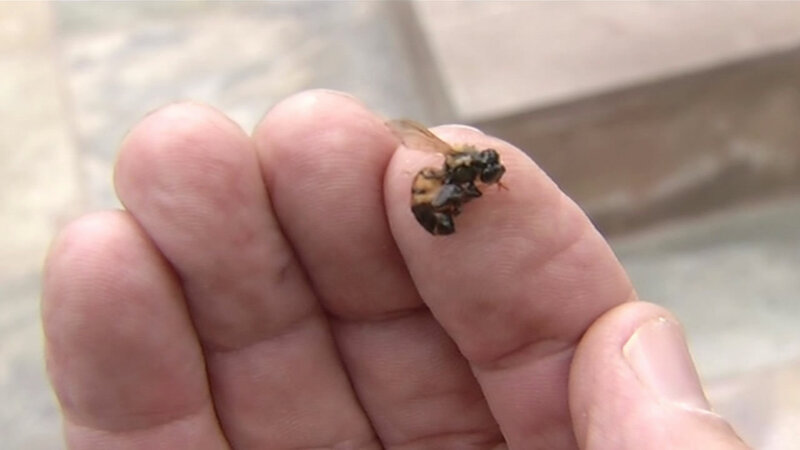 We've been having Africanized bees moving into California for quite a few years up from South America,"Norm Lott of the Mount Diablo Beekeepers Association. "I feel like my whole head was buzzing. They were all over my hair. I had to get out my hairband and shake it out. They were covering my hair," said Concord resident Maryia Piatraets. Beekeepers say they're using pheromones to calm the bees. They say it is bee swarm season and it's common to get calls, but this particular hive is more aggressive. The plan is to wait until the sun goes down and at that point, bee experts say it'll be easier to round up the bees and get them out of here as soon as possible. Police are recommending that people stay away from the area. Bay City News contributed to this report.